Welcome to day four of my FIVE Days of Summer "Un-school" series. If you've just joined in the fun, I should warn you...I am NOT an un-schooler. I am a P-L-A-N-N-E-R...in big, BOLD capital letters!!! But, even a "planner" has a free-spririted moment every now and again. As soon as the May page gets ripped from my calendar, all formal schooling comes to a screeching halt! But, don't assume that just because you won't find a flashcard in sight that there is no learning happening. During the summer months, most of our math comes in the form of games and real-life learning. Since Joan over at Our School At Home is tackling the "real-life" part in her weeklong Real World Math series, I'll take "games." 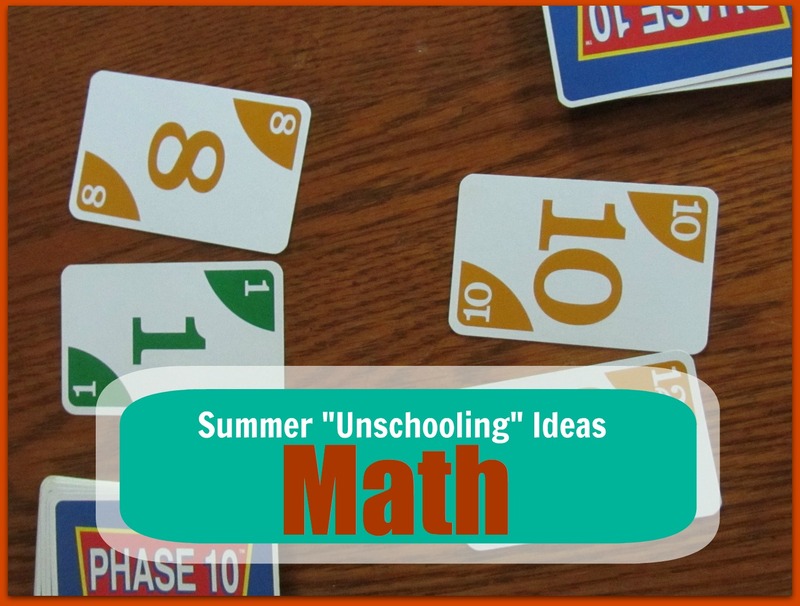 Here's a look at some of our favorite summer math games. This simple card challenge from yesteryear has been a review staple with my boys who love the challenge that each "battle" brings. After removing all the face cards, split the deck in half. Each player flips over one card to "challenge" the flipped card of his opponent. Whoever flips over the card with the highest value wins that battle and gets to "capture" both cards into a victory pile. After all cards have been flipped, each player counts the cards in his/her "victory" pile. The WAR is won by the player who has captured more enemies. Toss in two...or even three...more cards per player and it gets a little bit more mathematically challenging! When Sweetie Pea and I play, we each flip over TWO cards, add (subtract or multiply) our cards together and use the sum as our "front line". If I flip a 3 and a 5, I add them together to make 8 and challenge her 2 and 9. Her front line would equal 11, and she would be the victor. Occasionally, our cards, when added (subtracted or multiplied) will have equal sums. In that event, we each flip one more card, add the value of the new flipped card to our first sum, and get a new sum. Since Super Boy learned his 0-6 addition fact families this past year, he can challenge his sister to this more-complex WAR version. We just remove the 7-10 cards prior to play. This card game is a math version of the simple preschool Memory match-up. First, remove all face cards from a regular deck. Then, determine a goal number...any number from 1-10 To play, lay all the number cards into rows...face down. The first player flips over two cards of his/her choice. If the player can prove how those two cards can be added, subtracted, multiplied, or divided together to equal the goal number, he/she may keep the cards and play again. If not, the cards are flipped back upside-down and the turn is complete. The next player may, then, flip two cards. The goal is to REMEMBER where the previously flipped cards are located to be able to combine them together and make a "match" (reach the goal number). For instance, if my goal number is 7 and I flip a 10 and a 3. I could say, "10 minus 3 equals 7" and win the match. Once all the cards have been matched, the player with the most matches wins the game. Many times, we end up with a few unmatched cards. These are set aside as "duds" and we tabulate our wins without them. Need another card games for math review? Head on over to the my Weekly Kid's Co-op and check out the Tens Go Fish game featured from Mom and Kiddo. A couple years ago, I printed off these yum-tastic pizza fractions from Disney's Family Fun on-line. I purchased a blank die at a game store, wrote fractions on five of the six sides and the word "take" on the other one. I threw in a couple of paper plates to create a family favorite review game. The game consists of five different paper pizzas with different toppings. Each pizza is divided into a different amount of pieces. A player rolls the die to determine how much pizza he gets to claim on his turn. If he rolls "1/2", he can take one piece of the Canadian Bacon pizza which is only divided into two pieces. Or, he can take two pieces of Cheese pizza which is divided into four pieces...and so on. If he happens to roll "take", he can nab any ONE piece from another players plate. The first player to create an entire "pie" wins the game. The best part about Pizza Pursuit is that ALL of my kids can play it...even 2-year-old Greased Lightening. While his two older siblings can practice fractional equivalents as they learn to exchange four 1/8 pizza pieces for one 1/2 sized piece, he can simply roll the dice, be told which topping to serve up, and attempt to make a full plate all the while getting introduced to fractions and mathematical terms. This is a summer-friendly way to bring math outside. Create a hopscotch course. (To ensure a level of difficulty, I prefer to create the numbers OUT of order.) 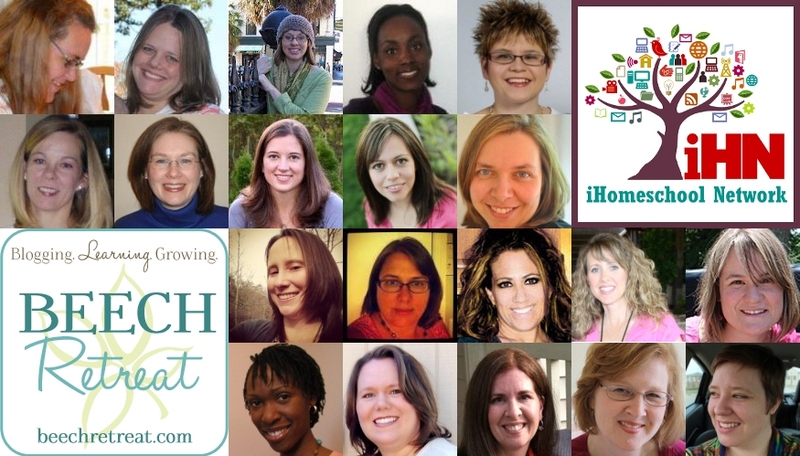 Determine what math process you wish to review. (For Super Boy's sake, we use addition.) Toss the rock onto the first square and then roll the die. Add the two numbers together. If you give the correct answer, you may hop. If not, your turn is finished and the next person gets to roll the die. All regular hopscotch rules apply. Often, in the busyness of the school year, our substantial collection of board games get forgotten. But, come summertime, we eagerly unpack them from the closet, blow off the thick layer of dust they've collected, and spend hot afternoons circled around a few of our favorites. Here is a list of some great MATH or MATH LOGIC-THEMED board games. For more board game ideas, be sure to check out the 5 Days of Family Games at Fruit in Season. Math has never been my favorite subject. During the school year, I put on my bravest face when it's time to teach decimal points and dividends hoping that my kids will see my contrived enthusiasm as sincere. But come summertime, when we take an acutely more relaxed approach to learning, even THIS mathematically challenged momma can enjoy...or at least stomach...'rithmetic! Five Days of Summer "Unschooling". Here's a look at the entire series. Fun ways to include math this summer! The kids get practice and don't even realize it :) I've been asking my daughter to help with reading recipes & measuring ingredients so she's getting some exposure to fractions this summer. Another great way to sneak the math into summer. I am NOT an un-schooler. I am a help me with math P-L-A-N-N-E-R...in big, BOLD capital letters!! Just stumbled across another math review game site called Math Playground. I needed something that could review single-digit addition and subtraction facts during the summer and this one fit the bill! Yes! Thanks for telling me. I'll have to look into it. Sadly, it looks like Family Fun Magazine has removed that one from the site.